our media are now saturated with such infographics, both on-and off-line, as a host of publications such as The New YorkTimes, Good, TheGuardian, Wired, Time, The Economist, The Believer, and The Wall Street Journal all regularly depend on data visualizations to provide their readers with that on-the-spot, quasi-highbrow sociological analysis. And many of the infographics created in these publications are pinned and repinned on Pinterest. Many people (myself included) are skeptical of the value and usefulness of these infographics. What exactly do they tell us about anything? Do they just look pretty on our computer or iPad or iPhone? I suspect that’s why they get pinned so much on Pinterest, which is often lauded for how “pretty” it is. A well done infographic, one that allows us to make connections and understand complex data can be a wonderful thing. But what about the bad or fluffy ones? What purpose do they serve? And why do people want to pin them so often? Lots of folks are discussing the limits and benefits of infographics. On my Pinterest board, Troubling Infographics, I’ve slowly been gathering articles about infographics and examples of (mostly bad) infographics. I’ve also added my own commentary, usually in the form of critical questions, to these infographics. After studying an infographic about twitter yesterday, I’ve decided that it was time to create my own infographic, or what I’m tentatively calling a dis/infographic, that troubles (challenges, questions, wonders about) the data on the graphic and how it is mis/represented. To create this dis/infographic, I’m putting my limited Pixelmator skills to the test. 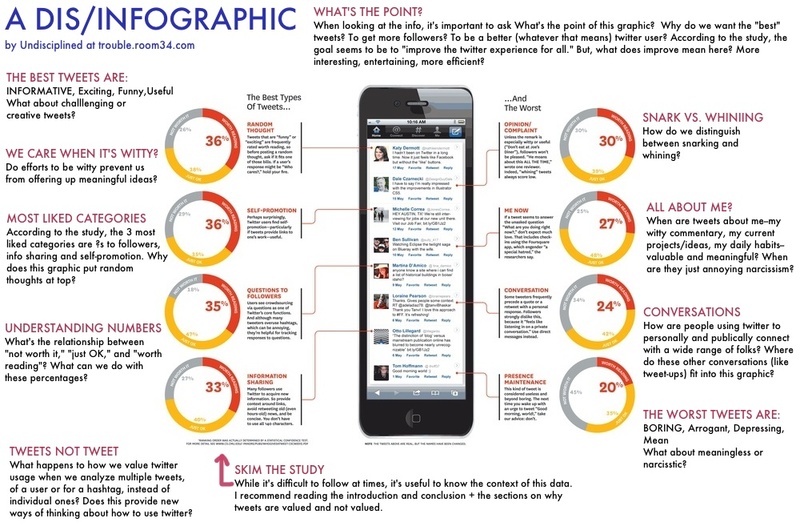 And, here’s the study that the original infographic (and my troubling of it) is based on: Who Gives a Tweet? While there are all sorts of ways to use twitter for making/staying in trouble, like sharing sources, posing/answering questions, connecting with other users, I use twitter primarily to document my notes, thoughts and reflections on the various ideas I encounter everyday. Sometimes I tweet my notes and questions as I’m reading an article. Sometimes I tweet my thoughts as I’m watching a show. And, while I haven’t really done it yet, I’d like to start tweeting my process of creating digital stories. In addition to using twitter, I also am researching it. I’m particularly interested in how people/organizations are using it to practice an ethic of care. Imagining twitter as a space for deep and meaningful engagement (and care) is troubling for many; the general consensus (based on both anecdotal evidence and popular and academic articles on twitter/twitter and ethics) is that twitter is bad for our souls. While many folks dismiss twitter as destroying (or at least weakening) our ability to be ethical, many (maybe some of the same folks?) encourage it as good for business and promoting our self-as-brand. I like the idea of people using social media for their businesses and for connecting with clients/communities, but in ways that are meaningful and more than just promotion. Okay, this infographic isn’t really that useful (well, isn’t that true of most infographics?) because there isn’t that much difference between the best and worst types of tweets and it’s organized very poorly. The more I look at it, the more confused I am about what I’m actually supposed to be learning about good tweeting practices. 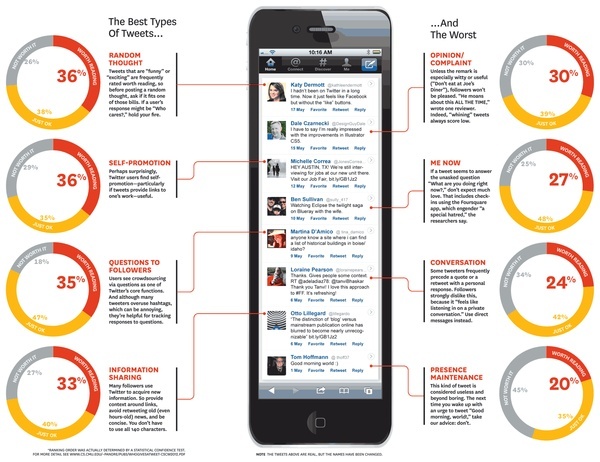 But, regardless of how bad this infographic is, it still is a helpful starting point for thinking through how many people use twitter to promote their own cleverness (“random thought”), their self-as-brand (“self-promotion”) and their expertise (“information sharing”). And this infographic is helpful in thinking through how my own practices of and reflections on/about twitter trouble these popular uses. In looking at the “worst types,” I am not surprised to see that many of my favorite twitter practices–“opinion/complaint,” “me now,” and “conversation”–are on there. Studying this infographic closely makes me want to do my own dis/infographic with Pixelmator. Look for it soon, along with more analysis of how my tweets trouble the best/worst types on this graphic.